A walk in the forest - with a purpose. Looking for a good location for an upcoming shoot with several photographers and models and an adventure theme. 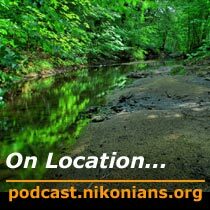 Click here to download Nikonians On Location Podcast #33 (NPC-OL-2008-09-08; 17:59; 8.4MB, MP3 format). Video supplement available here (NPC-OLV-2008-09-08; 3:15; flash format). Martin found the perfect spot for the shoot, and this slideshow shows a few of the many options. But he will have to do further preparations to gain access in car. Short and sweet: Trees, stream, shallow water, steep banks, great views. The perfect place for an adventure themed shoot. Email Martin at onlocation@nikonians.org, or drop us a line in the Podcast Feedback forum!